WB Board 10th Result 2019 - The West Bengal Board of Secondary Education (WBBSE) will declare the West Bengal Board 10th Result 2019. As of now there is no official news on the release of the WB Board 10th Result 2019. We at JagranJosh are continuously working with the WB Board to bring the latest news in regards to the WBBSE Result 2019. If previous year trend is to be considered, the students can expect their WB Class 10 Result 2019 to be out in the first week of June, 2019. Last year, the WB Board 10th Result was announced on June 6. Generally, the board follows the similar timeline each year to announce the most-awaited board result. Upon formal declaration, the West Bengal Board 10th Result 2019 will be first uploaded on the official website- wbbse.org or wbresults.nic.in. In addition, the result will also be made available via a live link shared on this page. To get the latest news and updates on the WB Board 10th Result 2019, students should bookmark this page. Read on to know more about the WB Class 10 Result 2019 including its important dates, process to access the result and what next. As of now, there is no official declaration from the side of West Bengal Board, regarding the Class 10th Board Exam Result. We are expecting that the WBBSE Result 2019 will be declared in June. Last year, the result was declared on June 6, 2018. For making it a little easier for students to check the result, we will be providing the WB 10th Result 2019 on this page, after they are formally announced by the West Bengal Board. Alongside this, the WB Class 10th Result 2019 will likewise be accessible on the official site of the board, i.e. www.wbbse.org. However, the official site might get slow due to the heavy traffic. If something like that happens, the students can check the result on our page. The marks of all the students who have appeared in the 10th Class Exam will depend on the way they will perform in the examination. But the past year statistics can give the students an idea of their expected scores in the WB Board 10th Result 2019. This way they can keep a realistic approach towards WBBSE Result 2019, rather than having high expectations. Below, we are providing some statistics from the previous years, to help them assess their expected West Bengal Board 10th Result 2019 scores. Looking at the statistics in the above table, it seems like that there is still scope for students to surpass the previous year record by putting up an excellent performance in this year's board exams. Even the WBBSE is hoping that the students will showcase a better success ratio in the WBBSE Result 2019. WB Board 10th Result 2019- What Next? After the West Bengal Board 10th Result 2019 is declared, candidates will be given option to check their result on the official website of the board. JagranJosh will activate the link in this article to help students check their WBBSE Results 2019. Students will be provided with the facility to download or print out their scorecard. The soft copy of the WB Board 10th Result 2019 can be used for academic planning. However, colleges and universities may not offer final admission offer until the final WB Board original marksheet is submitted. Until then students can use the WBBSE Result 2019 for provisional admission purpose. Now that the secondary education level is complete, students will have to decide what next in their higher education path and pick the right stream to pursue their dream career. The West Bengal Board 10th Result 2019 day will be exciting and nerve wrecking for some. The result may bring in different emotions in every student. Some may experience joy and some may be disappointed with how their WBBSE Result 2019 turned out to be. There may be instances where a student may feel he had done better than the scores obtained, in such case he may seek for re-checking/ re-evaluation process that is offered by the WB Board. The re-evaluation and re-checking are important aspects with regard to the WB Board 10th Result 2019 that a student must keep in their mind. In case the students do not feel that their efforts have been truly justified in the scorecard, they can apply for re-checking / re-evaluation of the answer sheets. In case there is any change in the final mark tally, the same would be updated in the original mark sheet. The WB Board 10th Result 2019 may also bring bad news for some students. There may also be cases where a student has unfortunately failed in the exams, he will be provided with another opportunity to prove himself. The student will be able to appear for the compartmental/ supplementary exam. The supplementary examination may be scheduled to take place in the month of June. The same will be notified here in this article and also by the board on their official website. Students are advised to bookmark this page for any update on the WBBSE Result 2019; they can also fill in their details on the link shared in this article to receive notification in regards to the West Bengal Board 10th Result 2019. WBBSE Madhyamik Admit Cards Releasing Soon admit cards are expected to be released soon. The datesheets for the same had already been released in December 2018. Check further details here. The West Bengal Board of Secondary Education has finally declared the WBSE Madhyamik Result 2018 on the official website, i.e. wbresults.nic. 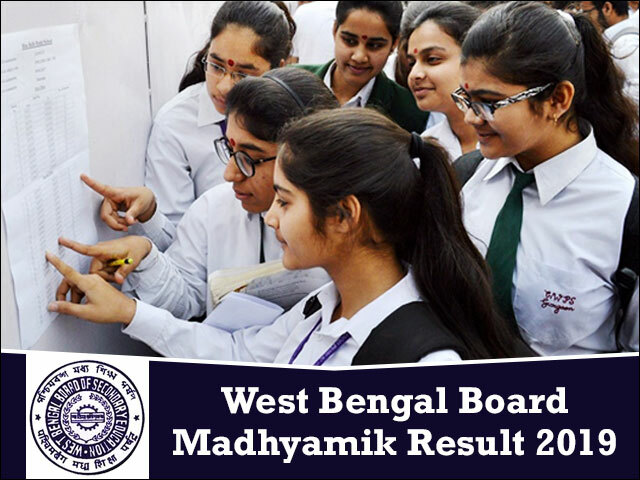 The West Bengal Board of Secondary Education (WBBSE) has announced the West Bengal Board Madhyamik Result 2018 today on the official websites of the board i.e. wbresults.nic.in and wbbse.org. This year, the West Bengal conducted the Class 10 examinations from 12th March to 21st March. The Madhyamik examination (class 10) will be held from March 12 to March 21, 2018, at various test centres across the state. The West Bengal Board of Secondary Examination (WBBSE) on Tuesday released the Schedule and Time Table of Madhyamik examination 2018. The West Bengal Board of Secondary Education (WBBSE) has declared the WB Madhyamik Pariksha 10th board examination results today. After the formal declaration, the WBBSE 10 Results 2017 will be made available to the students online on official websites i.e. wbresults.nic.in and wbbse.org. West Bengal Madhyamik Result 2017: The WBBSE Madhyamik 10th Result 2017 was announced by the West Bengal Board of Secondary Education (WBBSE) today. Madhyamik Pariksha Results 2017 for Class 10 students was announced by West Bengal Board of Secondary Education (WBBSE). The WBBSE Result 2017 will be available on official websites www.wbresults.nic.in and wbbse.org. The West Bengal Board of Secondary Education is expected to announce the West Bengal 10th Result 2016 on May 10. Students can check their West Bengal Madhyamik Exam Result 2016 by logging on http://wb10.jagranjosh.com, wbbse.org and wbresults.nic.in.